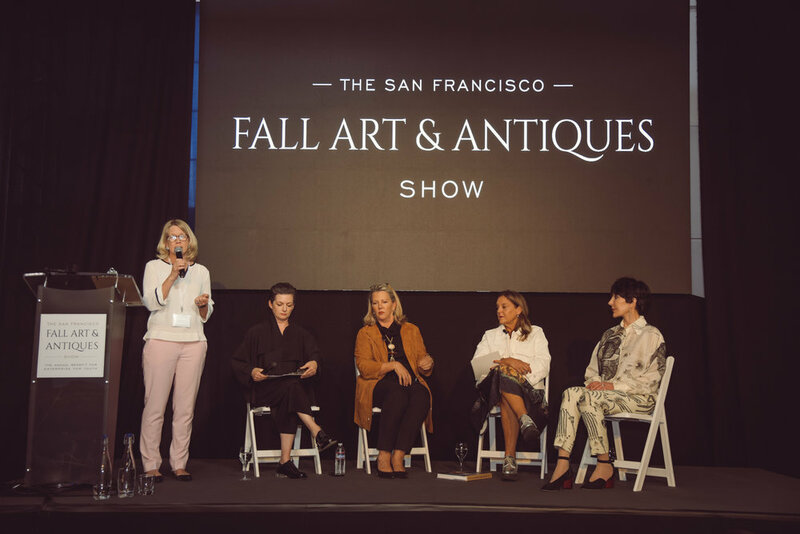 During the San Francisco Fall Art & Antiques Show, Coupar had the privilege to attend an incredible panel discussion, focused on Decorating with Art & Antiques. Author and editor Alisa Carroll moderated the informative panel. Held at the Fort Mason Center for Arts & Culture, the event featured leading professionals in the design industry. We heard from esteemed designers Suzanne Tucker of Tucker and Marks and Cynthia Spence of Cynthia Spence Design, along with International Color Consultant Joa Studholme of Farrow and Ball. Thank you to sponsors The Bath + Beyond and California Home + Design, Creative Partner ASID, photographer Hernan Santander, and Napa Ridge Winery for providing the libations. Coupar client, Cynthia Spence shared her insight on incorporating modern art with antique rugs and tribal textiles into her clients' contemporary interiors. The Director of The San Francisco Fall Art & Antiques Show, Ariane Trimuschat, introduced the esteemed panelists and moderator. The Director of The San Francisco Fall Art & Antiques Show, Ariane Trimuschat, introduced the esteemed panelists. The Bath + Beyond and California Home + Design sponsored the event with Creative Partner ASID and Napa Ridge Winery providing the libations. All photography by Hernan Santander.